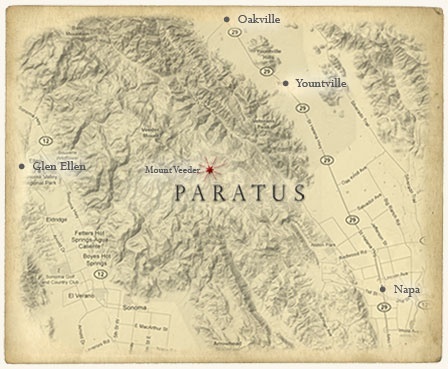 Paratus Vineyards sits at 38 degrees north and 122 degrees west in the middle of the Mayacamus range, surrounded by rustic canyons and peaks with dramatic views of Napa Valley to the east and Sonoma to the west. A short hike further up the mountain even affords views of Marin County’s Mount Tamalpais, the Golden Gate Bridge, and San Pablo Bay to the south. There are only three roads that provide access to Mount Veeder’s windy eight-mile stretch: Redwood Road from Napa, Dry Creek Road from Oakville, and Trinity Road from Glen Ellen. All are favorites of biking enthusiasts who climb the heart-thumping inclines to enjoy the redwood-forested countryside and breathtaking views.